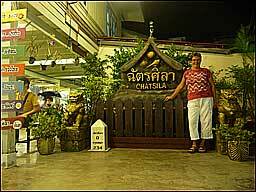 In the center of Hua Hin the night market is the top tourist attraction. Around 5pm people of all nationalities come out to walk around, have diner, shop for souvenirs and have a cocktail, etc. 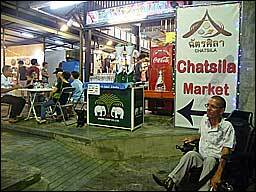 Bangkokians visit in the weekend and the market will be crowded. 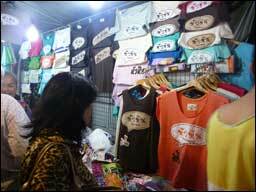 Don´t forget to buy flipflops, a nice T/shirt, a bag or maybe some Thai music. 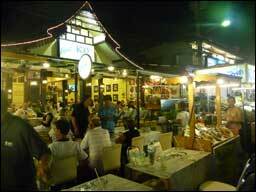 Try the Rotee, Thai pancake, or the coconut ice cream. Don´t miss out on the sticky rice with mango. 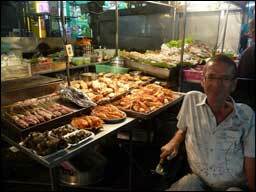 The driver will drop you off near the night market and will pick you up at the same spot where he left you. Wheelchair accessible restroom in Colonnade Mall.